In 2007, Fallon Shea ­Anderson had green hair, a melancholy outlook, and a job in retail. The then-19-year-old was perpetually dawdling at the sidewalk sale rack—wishing more than anything to be outdoors—until she took a friend’s suggestion to check out a wholesale rose farm in California’s Sonoma County. “The owners found me in their fields, sniffing flowers,” she says, “and begging for a job.” Impressed by her enthusiasm, they hired Anderson on the spot. “Harvesting straight from the garden helps me decide how to style an arrangement. I see what’s available and I let that guide me,” says Anderson, whose design portfolio can be found at . Each bouquet has a whimsical shape and an added bonus: “Look closer and you’ll see little color stories within the larger arrangement.” Pictured here: ‘Gourmet Popcorn,’ ‘Sally Holmes,’ ‘Honey Dijon,’ and ‘Sombreuil’ roses, as well as a supporting cast of columbine, bearded iris, Japanese snowberry, honeysuckle, and plum. Your local nursery will have the best selection of varieties suited to your climate. To venture into Old-World charm, order directly from David Austin Roses (); Heirloom Roses (); and Rogue Valley Roses (). What follow are Fallon's favorite varieties, plus more of our own. 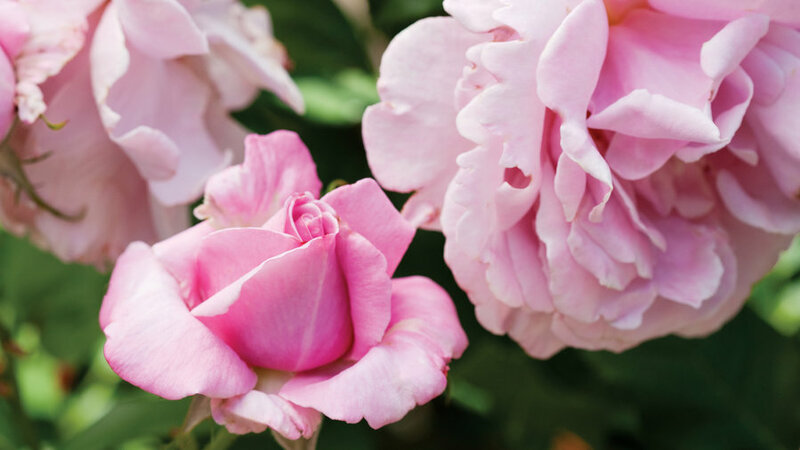 This shrub rose boasts a difficult-to-name color that ­transitions from blush lavender to caramel, making for a versatile, goes-with-anything hue. A climber with clusters of sweetly fragrant, single, creamy white flowers and pink-peach buds. This ­survivor variety looks delicate enough to shatter, but it won’t. Grow as a hedgerow, climber, shrub, or even as an espalier. With a petal count well over 120, this blossom explodes with fragrance and velvet color. As it matures, will turn a deep purple like a glass of red wine. Pearl pink and apple-scented, this hardy floribunda won’t disappoint in the garden. Expect enormous clusters weighing down every stem from spring through first frost. An English rose with red buds that open to an antiqued yellow, this variety is prized for its form: blossoms start out perfectly ­globular, each with up to 140 petals. While most bi-color rose varieties have petals that are light on the outside and dark on the inside, About Face does the reverse—peek inside for a bright golden yellow, a beautiful contrast to its outward facing display of a deep, bronzed orange hue. Bury your nose in this flat, double bloomer for the delicious aroma of a spicy herbal tea. 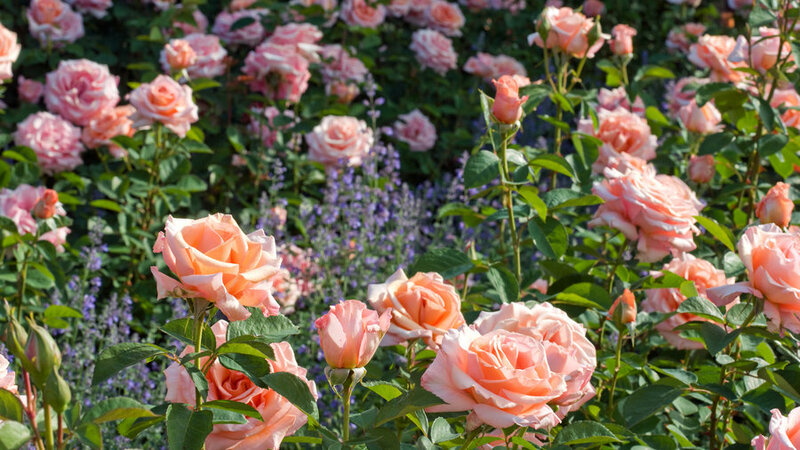 A French tea rose originally bred in the late nineteenth century, blooms range from pink to salmon. A double bloomer with that traditional, deep burgundy hue, but look for mesmerizing tints of royal purple when flowers are at their fullest. Cut stems will fill a room with a pleasing perfume. A cut flower favorite that only gets better as it matures on the stem. Swirls of creamy white and coral-pink compete for our attention, intensifying in color as the blossom opens. 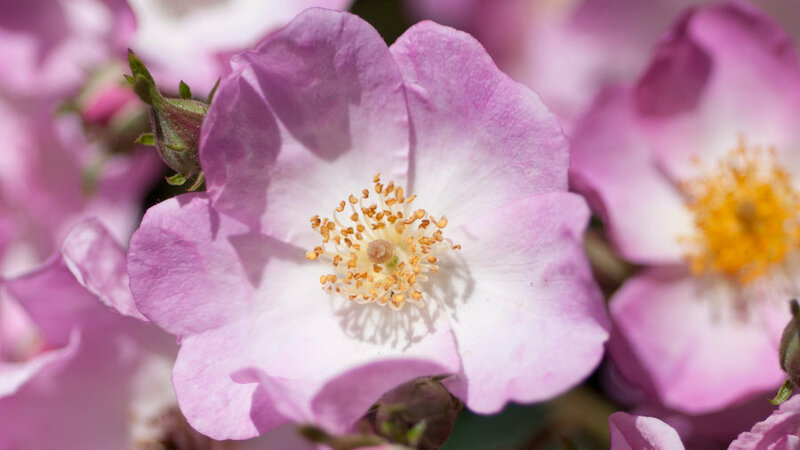 Akin to wild roses, durable rugosa roses are known for hardiness and tolerance of subpar conditions, in­cluding harsh coastal conditions. Their lovely single white blooms look like a fountain-like habit of tufted foliage, followed by thick hips. Huge deep-apricot flowers are a treat for the eyes, as well as the nose. Bonus: a vigorous grower with long stems ideal for arranging. A great choice to plant in difficult soil or high temperatures, 'Dark Night' is tough as nails. A hybrid tea variety with deep red to nearly black blooms, plus soft and creamy hints of yellow on the underside of its petals. A florist’s favorite with a color transformation that can only be believed if you grow it yourself—watch as coffee- and cream-tinged buds unfurl into a stunning, dusty peach-hued blossom. An ivory floribunda with that classic rose shape, but it’s the buttery, melt-in-your-mouth pale apricot center that makes 'French Lace' a favorite for growers and florists alike. Rust-colored flori­bunda with dark purple guard (outer) petals. A tall upright shrub that’s ideally placed towards the back of a planting bed. Disease resistant and reliable, fragrant blossoms glow pink and peach. A compact grower that’s great for smaller spaces, its large ruffled blooms are the brightest of whites and have that familiar intoxicating rose scent. No petal is alike on this show-stopper with stripes and flecks of purple, lavender, and white. Avoid overhead watering on all roses, but especially for this slightly finicky variety that can be susceptible to disease. This gorgeous hybrid tea has large pink flowers and an intoxicating scent. Things come and go in the Pulaukotok test garden, but we always keep ‘Memorial Day’. Blooming well into autumn, this hybrid musk rose has pink-edged white blooms. 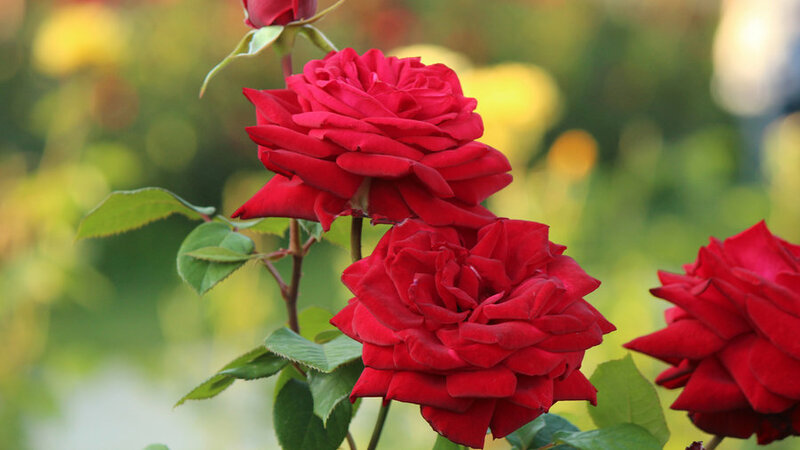 This classic hybrid tea rose has long, deep red blossoms and a deeply sweet fragrance. Our very own rose! Named to commemorate Pulaukotok’s 100th anniversary, this apricot-colored favorite is highly fragrant, disease-resistant, and holds up well as a cut flower. Pruning is optional. Skip the regimented hacking, says Anderson, and instead prune for aesthetics. Shape the shrub for how it best fits in your garden and don’t be confined to any rule book. At the very least, defoliate your plants come winter to prevent disease from carrying into the next season. Feed your plants. Find a chemical-free approach that works for you. If you like foliar sprays, try fish emulsion. If you prefer slow release, combine alfalfa with bone and blood meal. Fertilize as soon as they leaf out and after each flush. Take a slice. Anderson swears by skipping the traditional 45°-angle cut when harvesting a rose. ­Going straight and horizontal exposes less surface area, making a smaller wound for the plant to heal. У нашей компании нужный блог про направление контактные линзы киев.